This feature is only available in iShowU HD and iShowU HD Pro under MacOS 10.5 Leopard to 10.6.8 Snow Leopard. For changes in later operating systems please refer to the MacOS 10.7 Lion and 10.8 Mountain Lion documentation. You can zoom in on a particular section of your recording if you want to highlight it or make it easier to read by pressing (Option+Command+=) or zoom out by pressing (Option+Command-_). 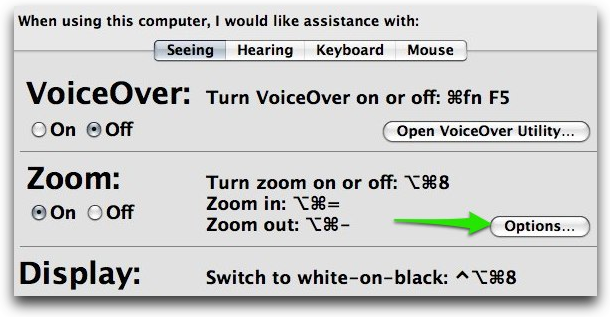 You can access the zoom in/out options by going into Universal Access in your System Preferences.